Luke Langsford tells us about his career path and how he came to be a Health Physicist for Babcock. 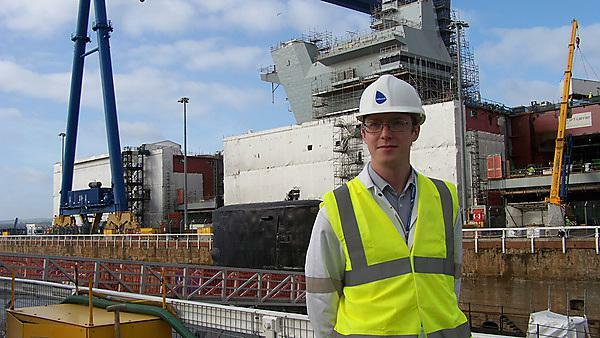 Since graduating I have had a number of short term contract jobs – R&D Chemist, Analytical Scientist for the Environment Agency, and Reactor Chemist on Royal Navy submarines undergoing refit at Devonport. After a while I wanted a more secure, longer term employment; I took a gamble and branched out of chemistry onto the Babcock Graduate Scheme at Devonport and haven’t looked back since! Honestly, the scale of the projects since joining the Babcock Graduate Scheme, the complexity, the variety, and the people have all been outstanding – not everyone gets to go on submarines on a daily basis for work! I believe that everything I did is part of where I am now. I love where I am now, both in and out of work, and I wouldn’t want to change that! Having embarked on a masters through work, I can honestly say that the lectures, labs, and coursework don’t seem so bad once you have worked a 9-5 job. I no longer start writing reports at 1am! Also, to remember that academia isn’t everything, it‘s also about the people you meet and the experiences you have along the way. I had no idea where I wanted to go to university so I went to a number of open days, such as at Reading and Bristol. When I arrived for the Plymouth open day I knew instantly that this was where I wanted to be: it was a gut feeling I just couldn’t ignore. I had some great support from the staff on my course, both from personal tutors and my dissertation adviser (one even offered me their surf board to borrow!). I also struggled with funding as I had no financial support from home; I approached the University in my second year and they gave me the support I needed, both funding and advice which was great. I instantly fell in love with the South West and realised that this was where I wanted to be, and have been very lucky to be able to do so. Although I am currently on a secondment through work in Rosyth, Scotland, I will be returning to Devonport at the end of my secondment for sure! My favourite memory is a difficult one as there are so many, but to pick one I would say my graduation day. I met up with my best friend after the ceremony, we left his parents with the champagne, grabbed our longboards, and went for a skate in our graduation gowns! The immense feeling of success was amazing, and plenty of people stopped us to say congratulations! My course taught me a wide variety of transferable skills which are highly desirable to employers, such as technical report writing and meeting tight deadlines. I also learned some valuable life lessons whilst at Plymouth. I’ve always been quite independent but not everyone is, and I saw friends develop from those who didn’t-know-how-to-use-a-washing-machine to those who were able to take care of themselves. For me, going to university is half of the degree and half of the experience. Plymouth offers great degrees combined with an absolutely fantastic student experience. I defy anyone not to fall in love with the South West!